Ubuntu is the popular operating system and it’s available as Ubuntu Touch OS for smartphones. It has a lot of personalize options and new lockscreen with animations. The Ubuntu Touch Lockscreen is now available for Android smartphones which gives a new look and replaces your default lockscreen. 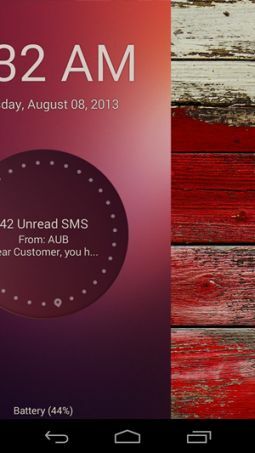 Ubuntu Touch Lockscreen is a simple, elegant and fast custom lockscreen that displays the notifications in a circle design with beautiful animations. With this app you can get message and call notifications within the ring design and you can control music playback options. There you can play or stop the music and move previous or next song within your lockscreen. There are more customization options available in this app such as lock timer, enable or disable the animations and changing animation time. 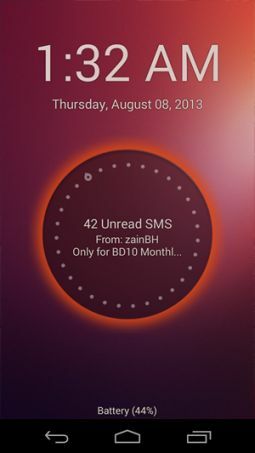 You can change the color of the circle for notification and run the lockscreen in full screen mode. You can set the password in security settings and you will enter the password when you unlock the phone. It is developed by XDA senior member Rotary Heart and the app is available in beta version on Google Play Store.